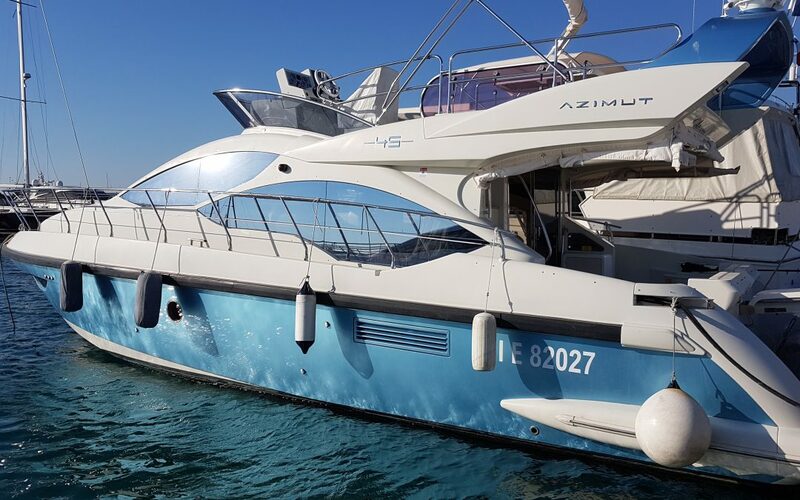 The Azimut 45 was introduced in 2011 and available in two or three cabin layout. 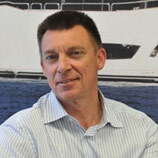 Powered by twin Cummins diesels which will give her a topspeed of around 32 knots, very quiet and economical. 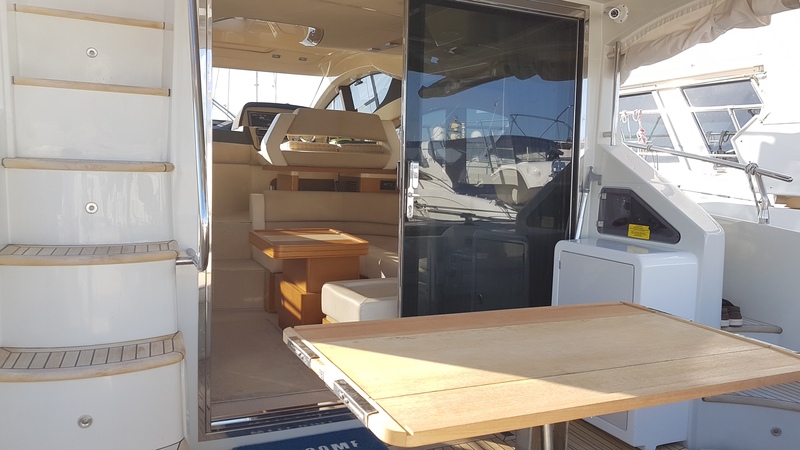 She is a very modern, stylish but also a practical yacht, with a hydraulic high/low bathing platform and the versatile flybridge layout: you can easily change the layout by moving around the furniture to make a large settee, a sunbathing area or a perfect space to enjoy lunch or dinner. 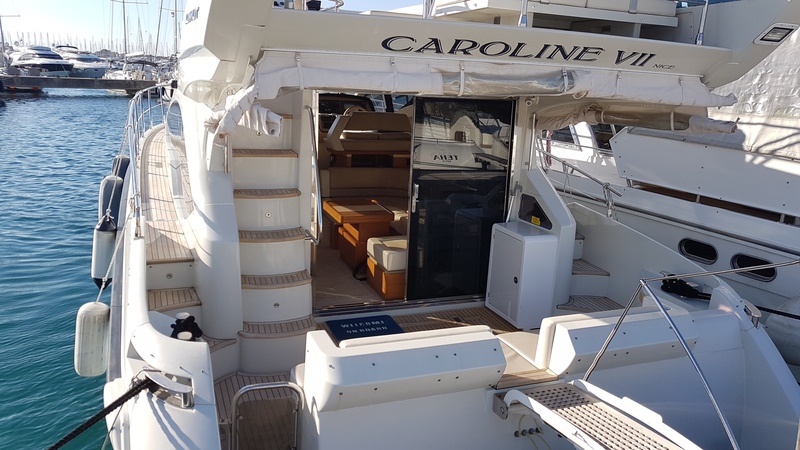 “Caroline VII” has the two cabin layout with the very large galley. 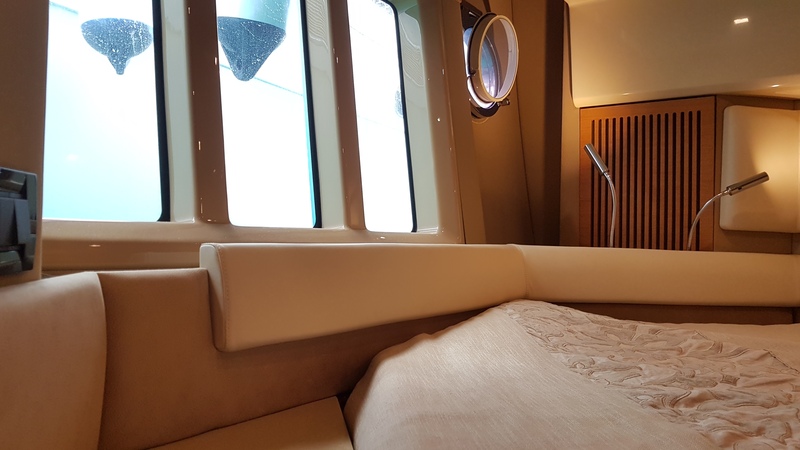 The salon settee converts easily in to a double bed, so this yacht sleeps 6 people. 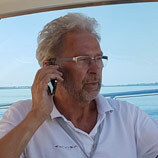 This yacht was used for the introduction of the model in 2011: the yacht on the advertisement movie is this actual yacht! 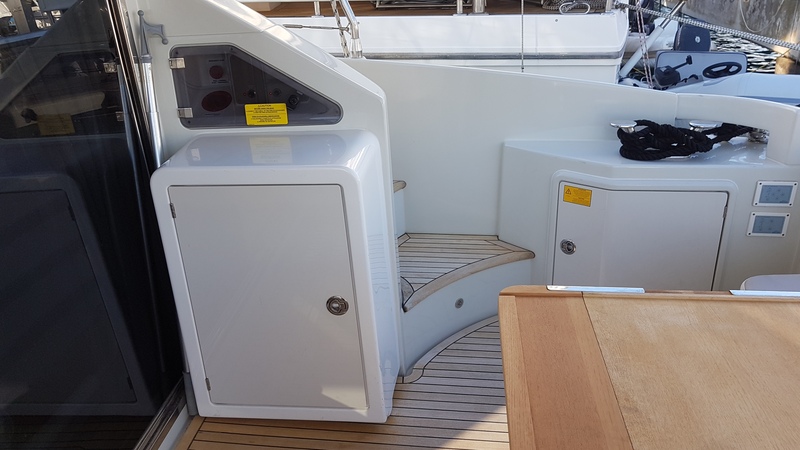 This 45 is full options with the Opacmare bathing platform and gangway, full Raymarine navigation set including TV satellite system and teak deck on platform, cockpit and side decks. 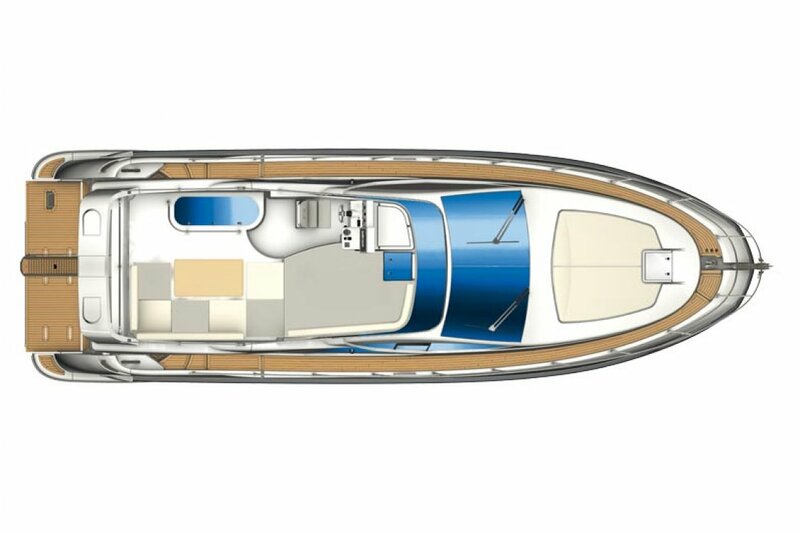 The hull and radar arch are painted in “Tenerife blue metallic”. 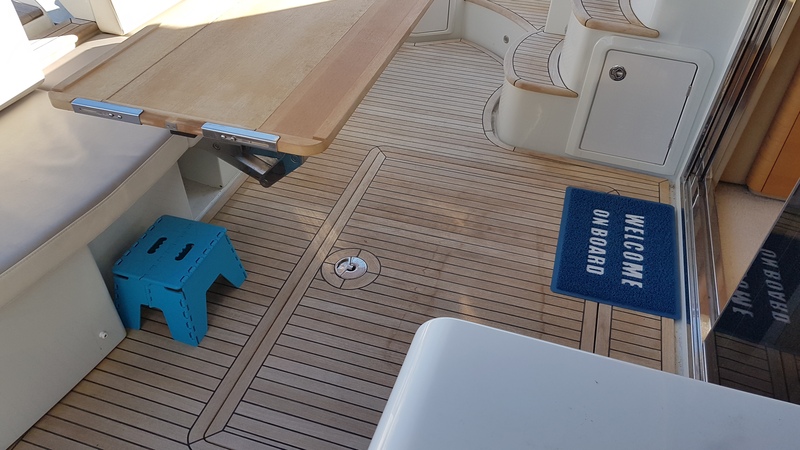 The cockpit is large for a 45ft and has a pop-up teak table and a second fridge. 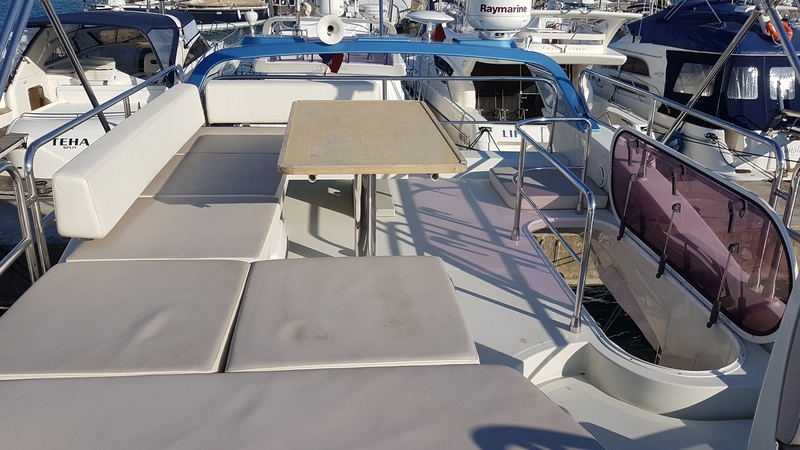 An extra lounge area on the foredeck for people who really love the sun. 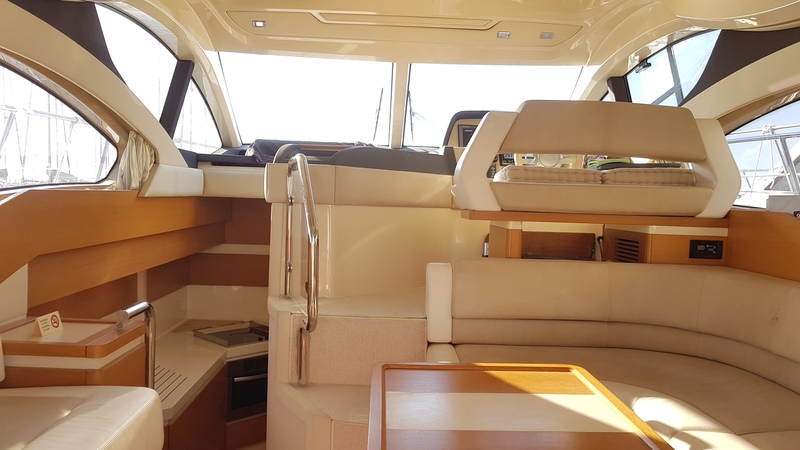 The side decks are fitted with teak which gives a luxurious feeling. 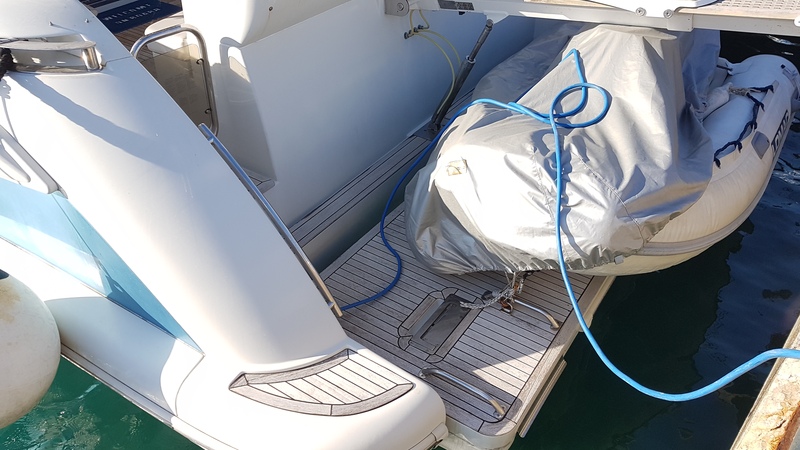 The wide foredeck and stainless steel anchor, electric windlass with chain counter and washdown system makes anchoring an easy job. 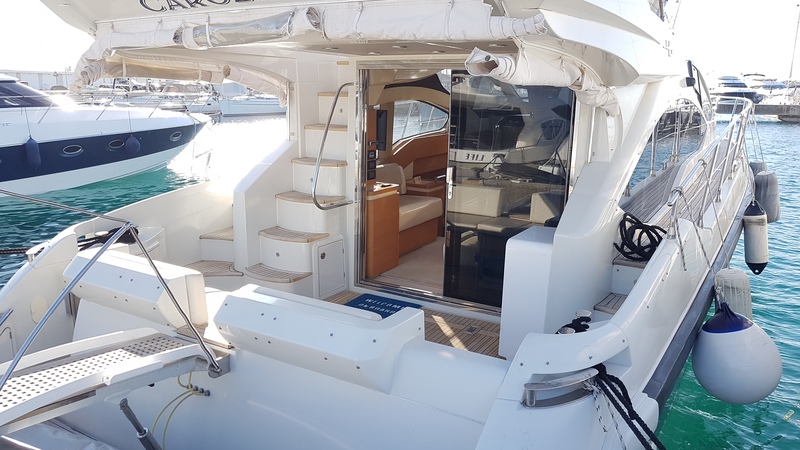 The 45 has a huge flybridge which can be changed to your needs. 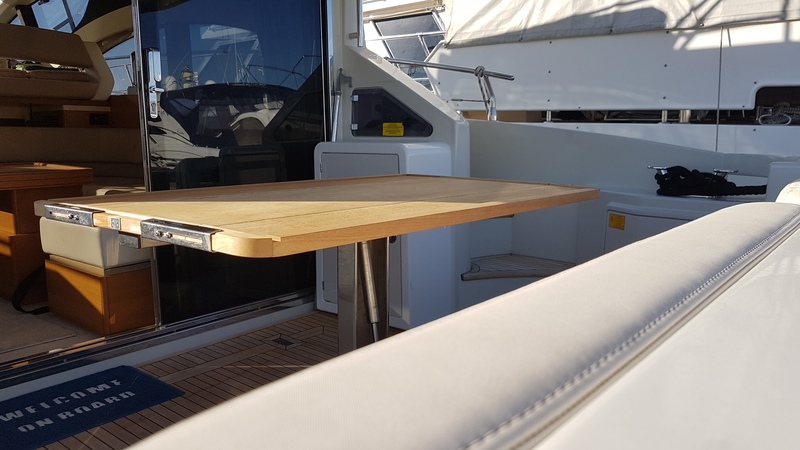 The teak table and several seats can be easily changed to make an L seating or a large lounge area. 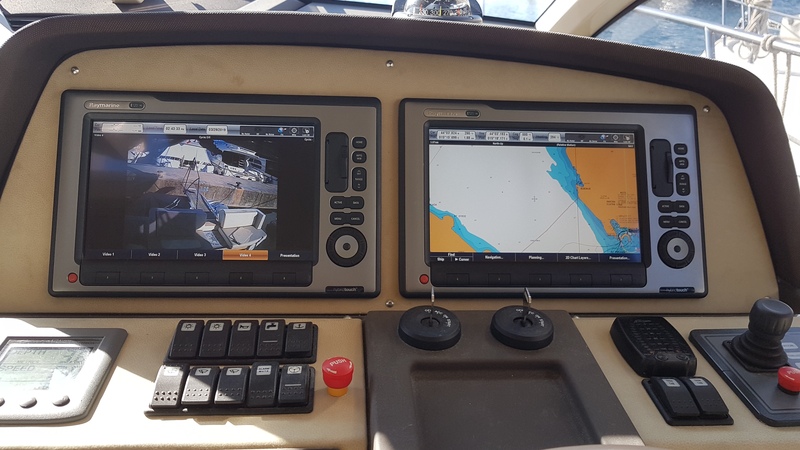 The dashboard is complete with a massive Raymarine E140w display, autopilot, tridata, a Ray240 VHF and the Xenta joystick which combines the Sidepower bowthruster with the two Cummins engines. 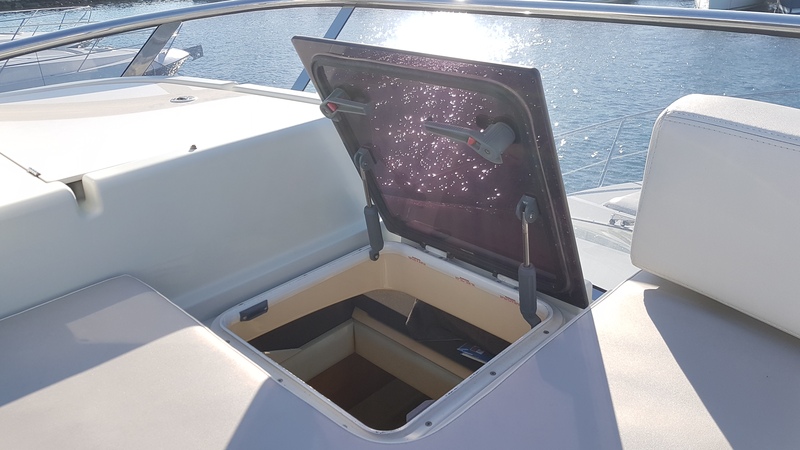 There is a hatch underneath the lounge area which provides fresh air to the salon but comes very handy to give drinks and snacks to the flybridge! 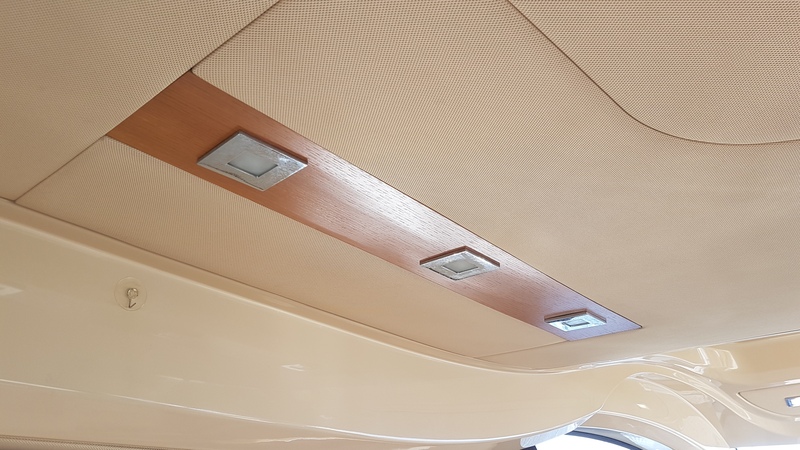 The Fusion stereo system is fitted with I-pod docking station and Bluetooth function. The salon is very bright with a lot of natural light and ventilation. It has an electric high/low table wich can unfold to a large dinner table and a pouf which you can move around. 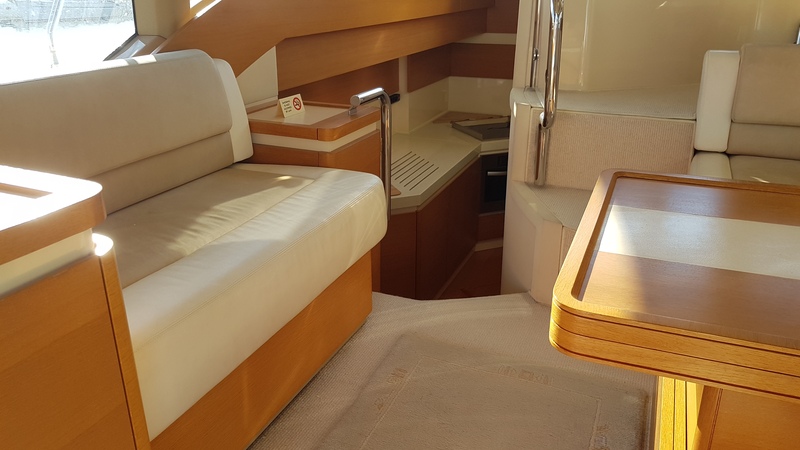 Underneath the starboard couch is a foldout double bed which totals the berths of this Azimut 45 at six! The electric high/low table is a small coffee table but can unfold to a large dinner table. 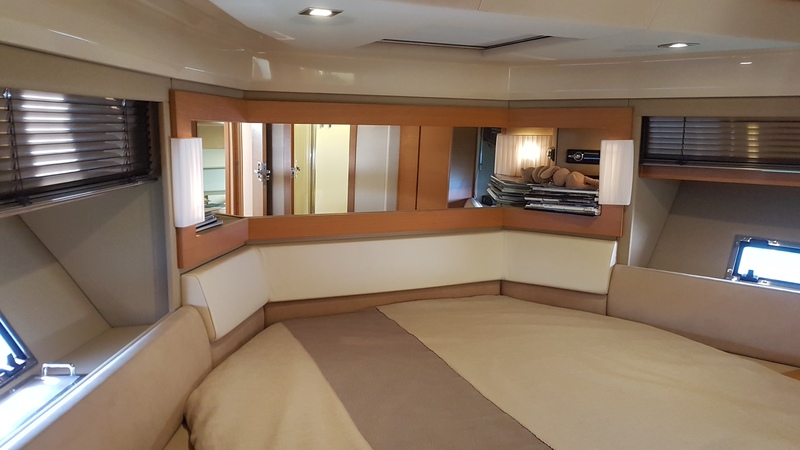 Underneath the starboard couch is a fold out bed. 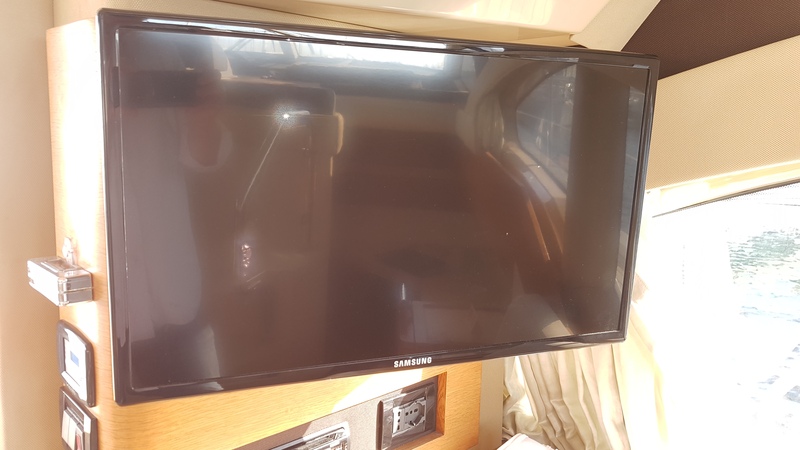 There is a Samsung LCD TV on a swivel, connected to the satellite system. 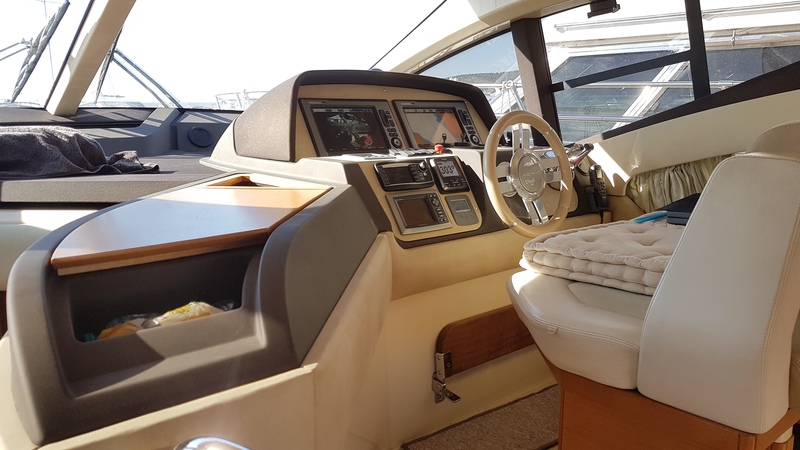 There is a radio/CD player and an I-boat system. 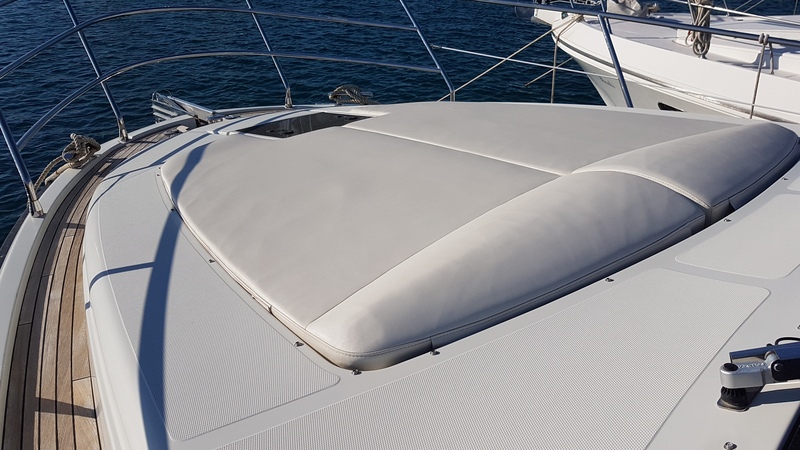 The sofas are fabricated in a two tone colour. 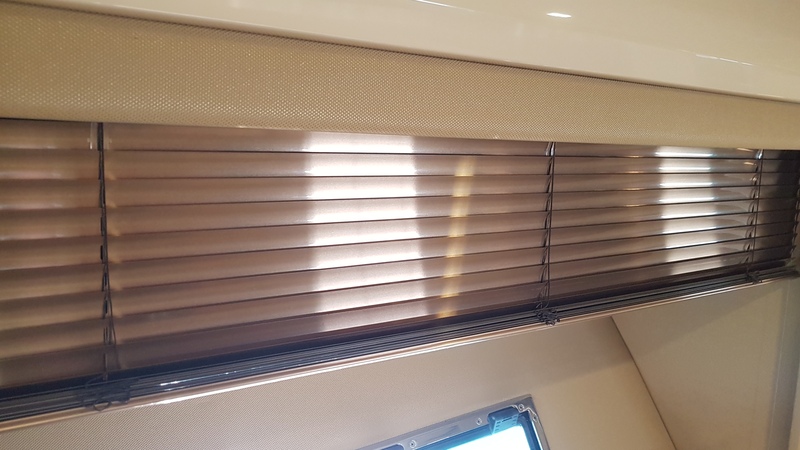 Together with the beige carpets and the satin gloss interior the salon gives you a very relaxing feeling. 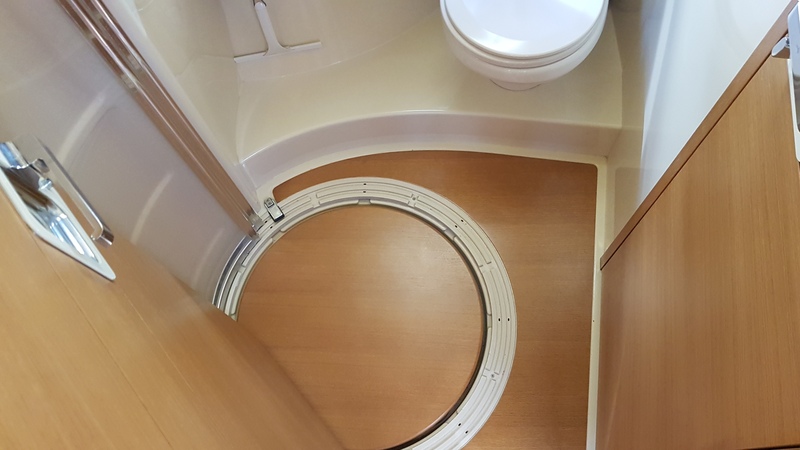 A few steps below is the very large galley, because of the two cabin version. Two steps above it is the well equipped helm station. The dashboard is very well laid out and there is an amazing view outside. 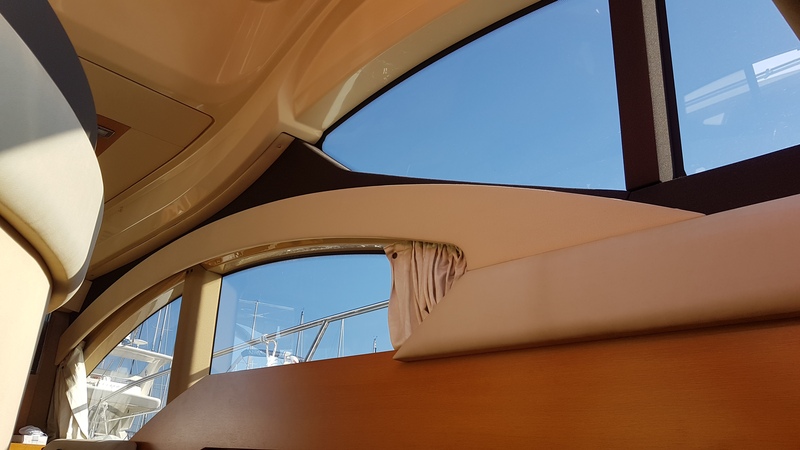 On the starboard side is a window that opens for natural ventilation. 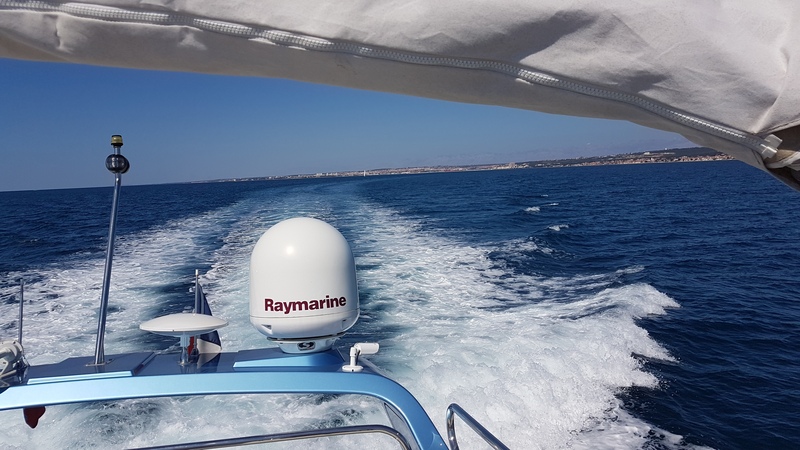 Twin Raymarine E120w displays will give you all the info you want. 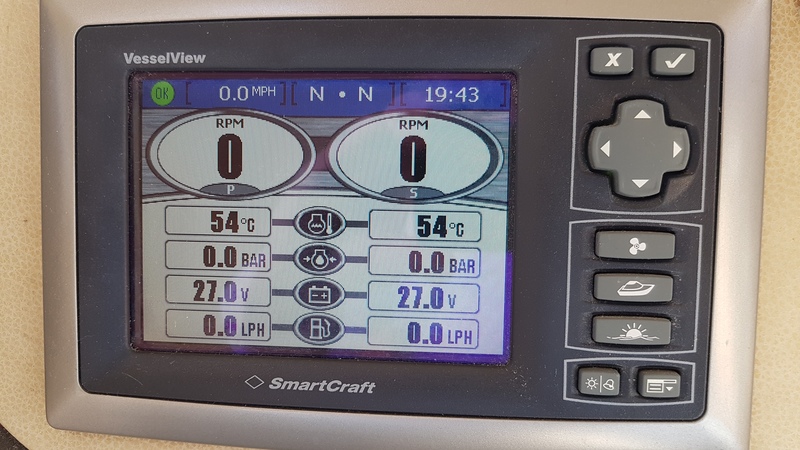 The Cummins engines have there own full color digital display and there is a dedicated Azimut display for all the main functions of the yacht. 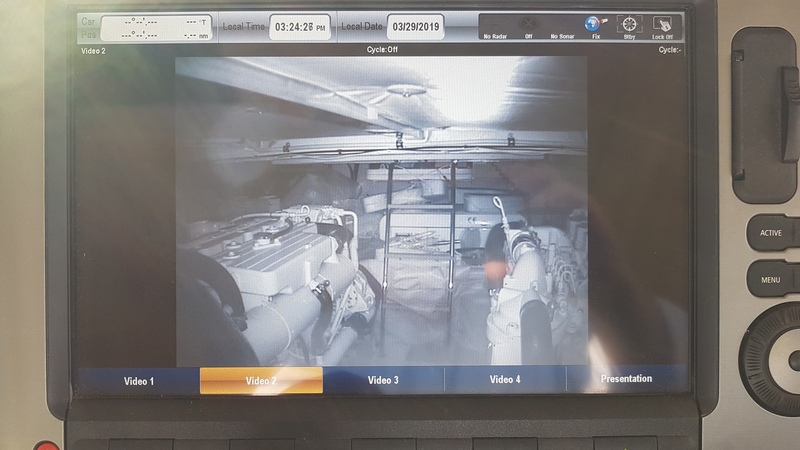 The Cummins QSB commonrail diesels use Mercury Smartcraft: a digital monitoring system system which provides all the info you need including fuel consumption. 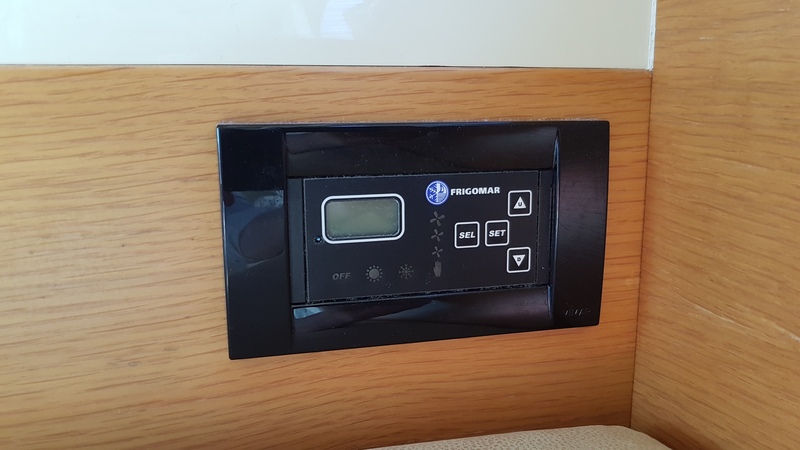 The original Webasto aircondition system has been replaced in 2016 by this Frigomar inverter type chiller which will run at 16A shorepower without any problem. 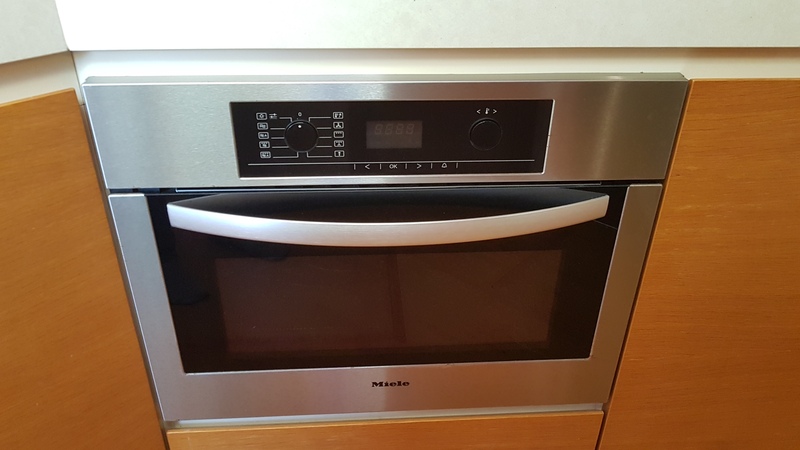 This system can cool down and warm up. 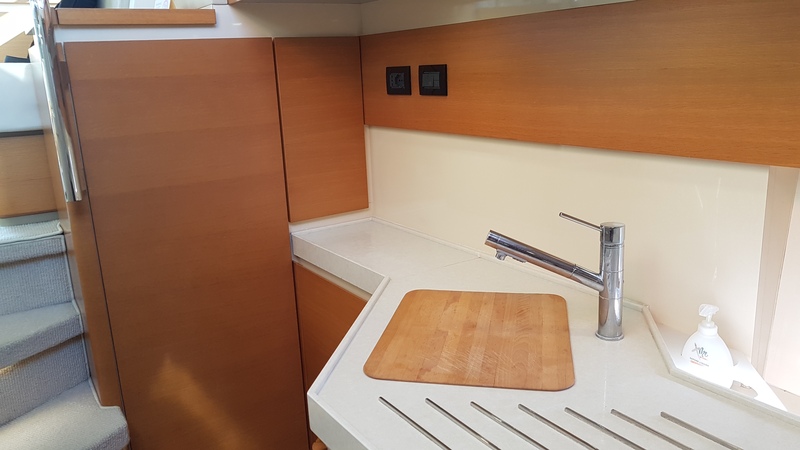 Due to her twin cabin layout, the galley is enormous. 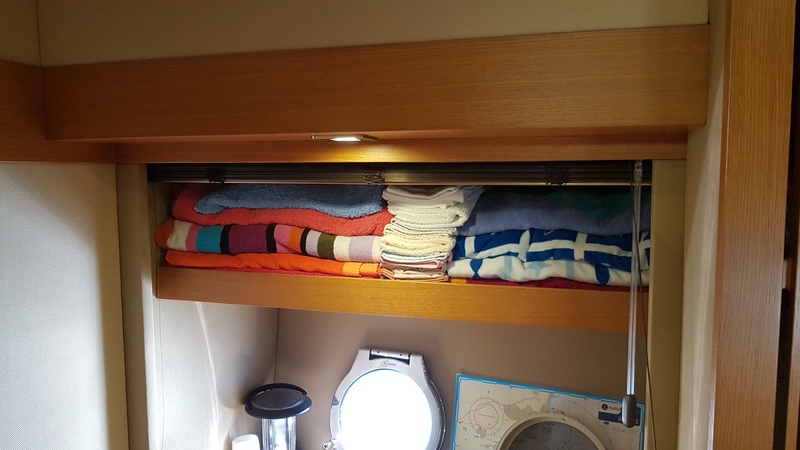 Underneath the wooden galley floor is extra storage space, there is a dishwasher, a large fridge with seperate freezer, stainless steel sink, three burner ceramic hob and a Miele combi microwave. 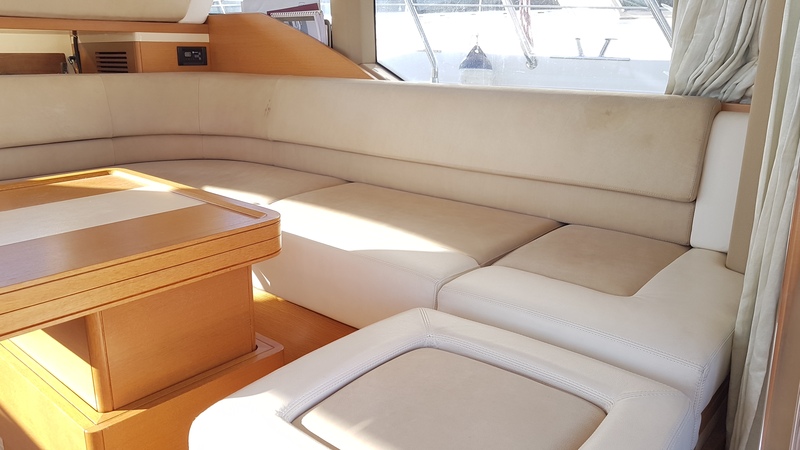 The natural light and lot’s of working space is exceptional for a 45 feet (or even much bigger) yacht! 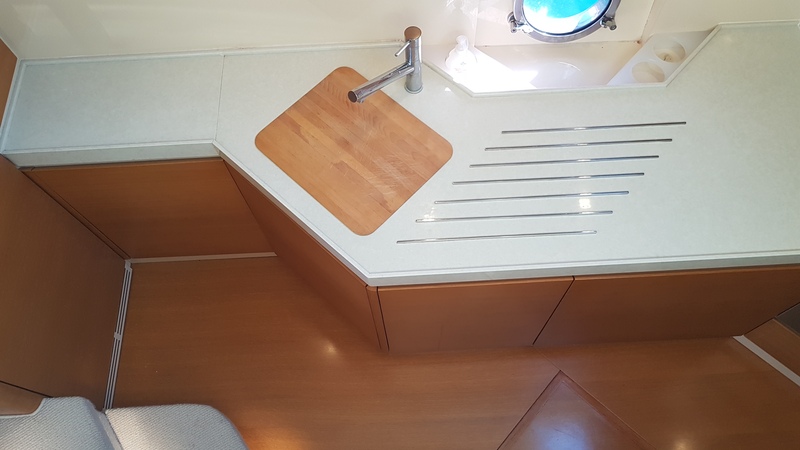 The galley is equiped with a wooden floor. Via the galley we step down to the cabins. 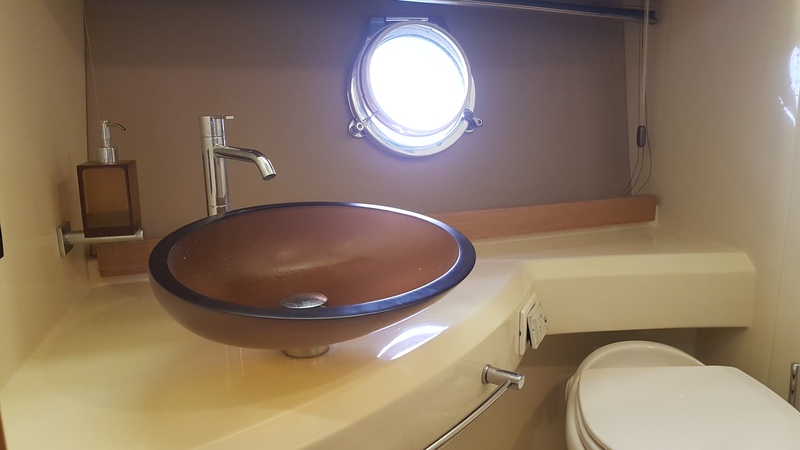 The VIP cabin is starboard and has it’s own ensuite bathroom/day toilet. 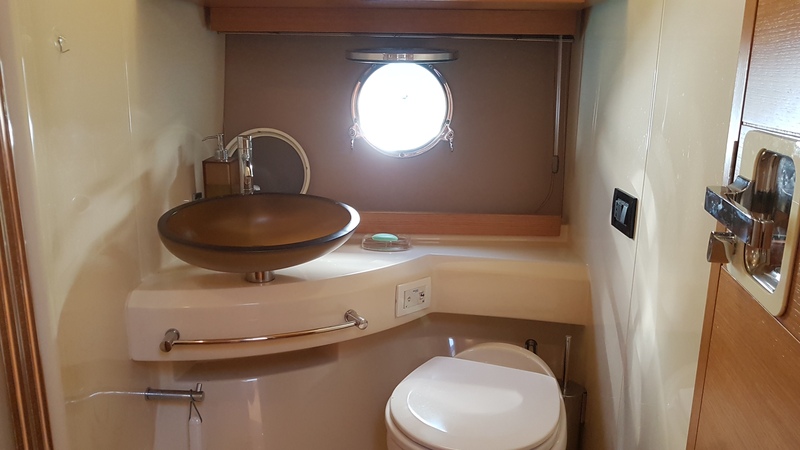 The owners cabin is forward, also with a bathroom with toilet and seperate shower. 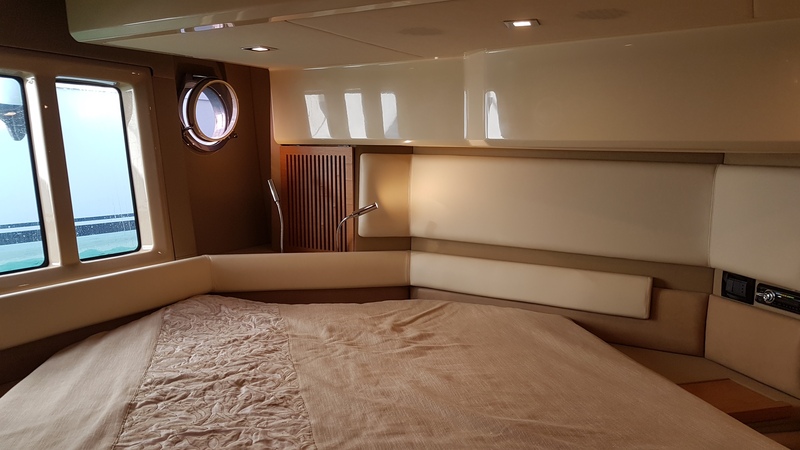 The VIP cabin offers a very large double bed which can be transformed into two single beds. Three very large windows gives your guests an amazing vieuw over the sea. 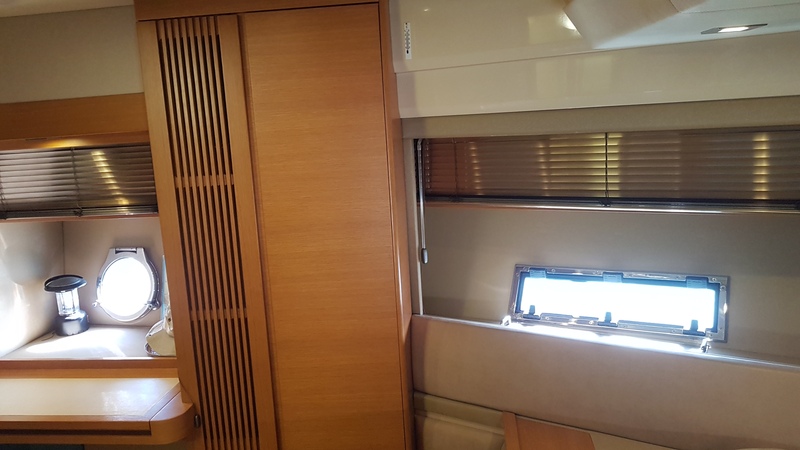 The reading lights, the mirror in front of the bed and the large hatch makes this room very bright and spacious. 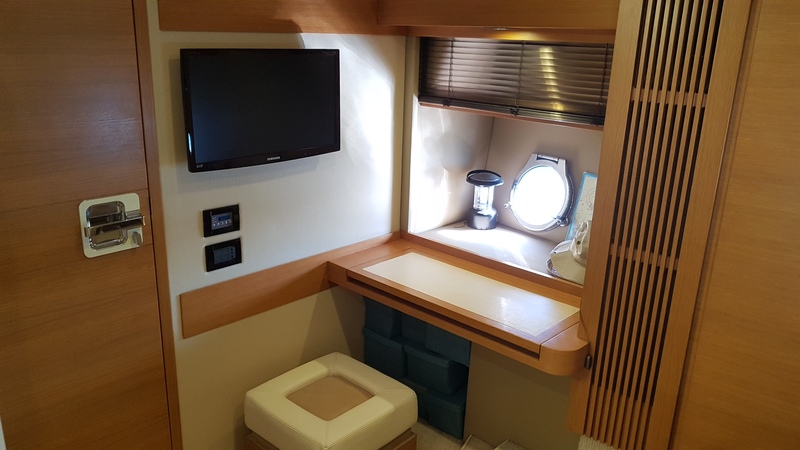 The bathroom includes a large shower stall, a Dometic electric toilet, a glass bowl and plenty of storage space. 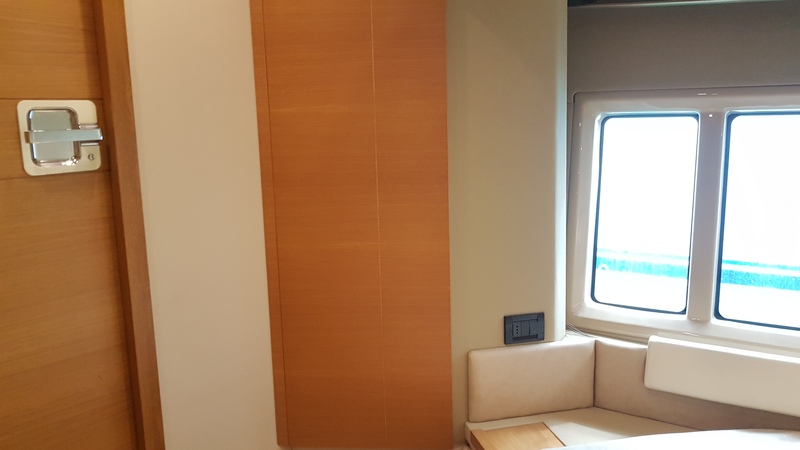 The owners cabin is very luxurious. 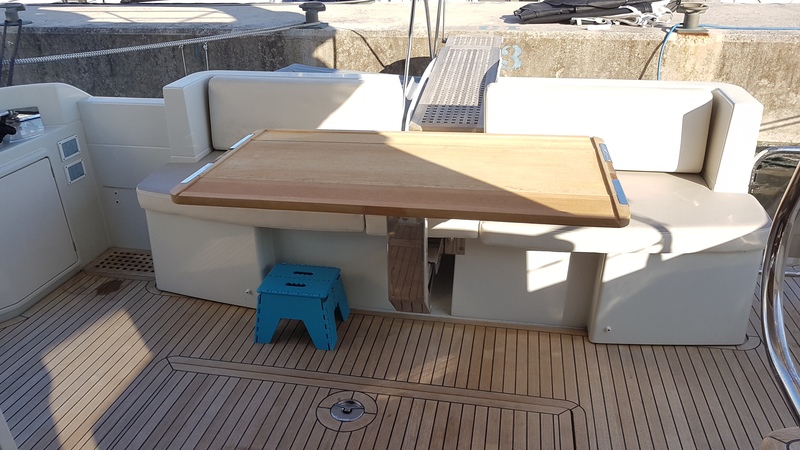 On the port side you will find a desk with storage space underneath. 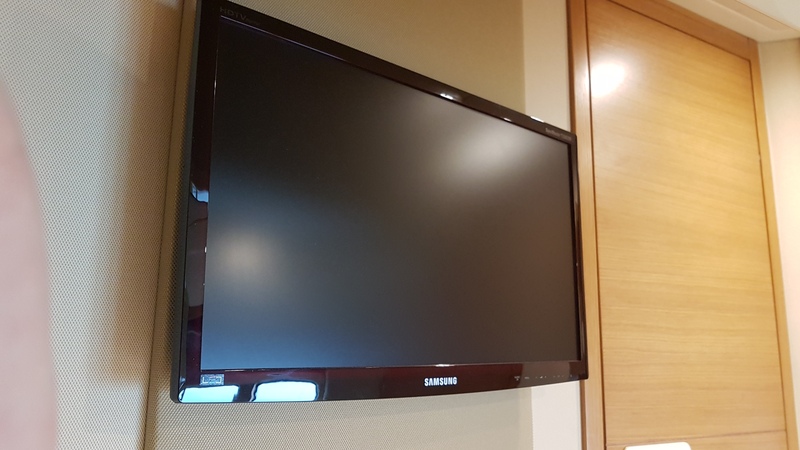 The Samsung LCD TV is connected to the satellite system. 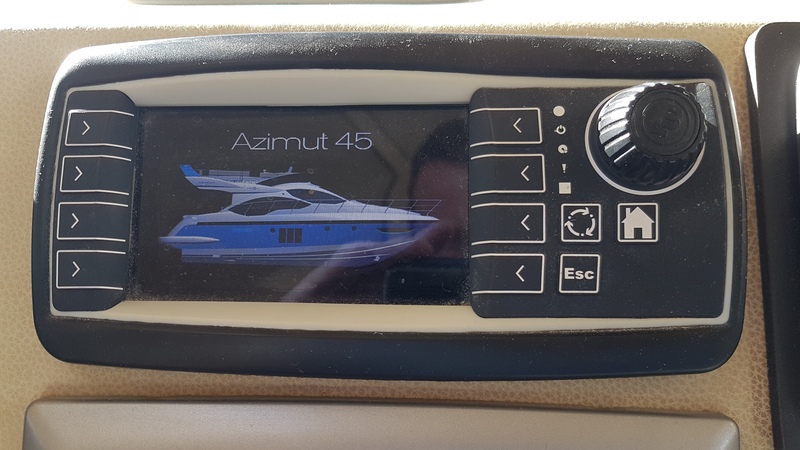 The Azimut 45 is powered by twin Cummins QSC5.9 480hp commonrail diesels with only 375 hours. 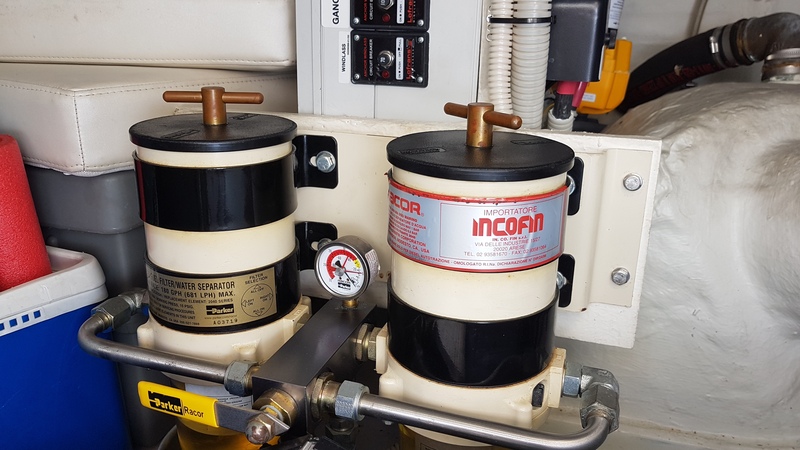 They are mounted to gearboxes with V-drive configuration, with stainless steel shafts. 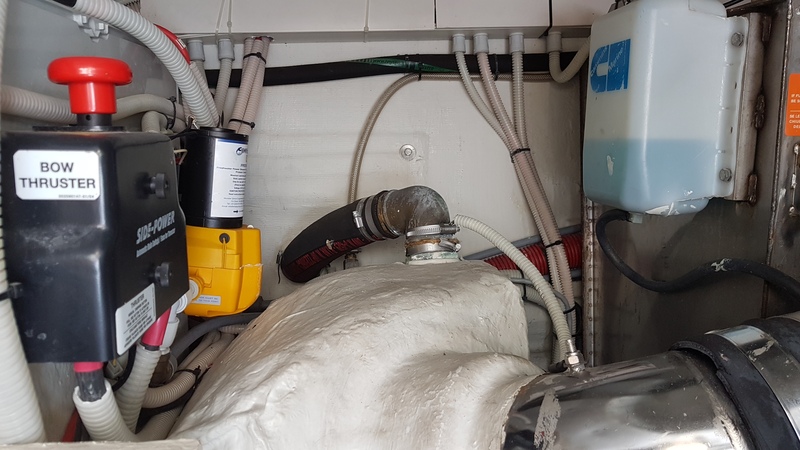 Like all Azimut Yachts this 45 has twin Racor fuelfilters for each engine, so in case of a emergency you can switch to a clean fuelfilter and continue your trip. 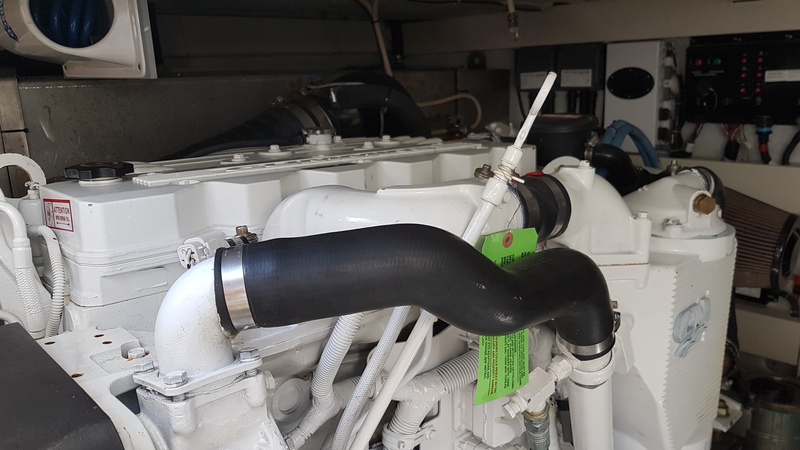 During this winter the intercoolers and charge air coolers were refurbished and a major engine service has been done. 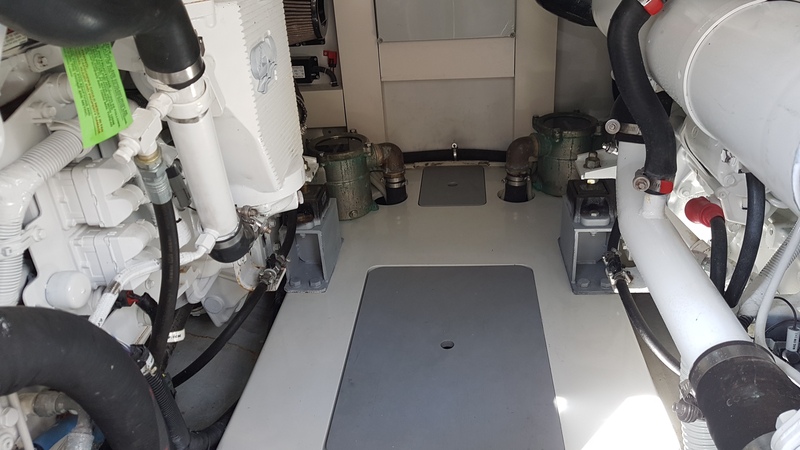 There is also a 9Kw Kohler generator with dedicated AGM battery and charger. 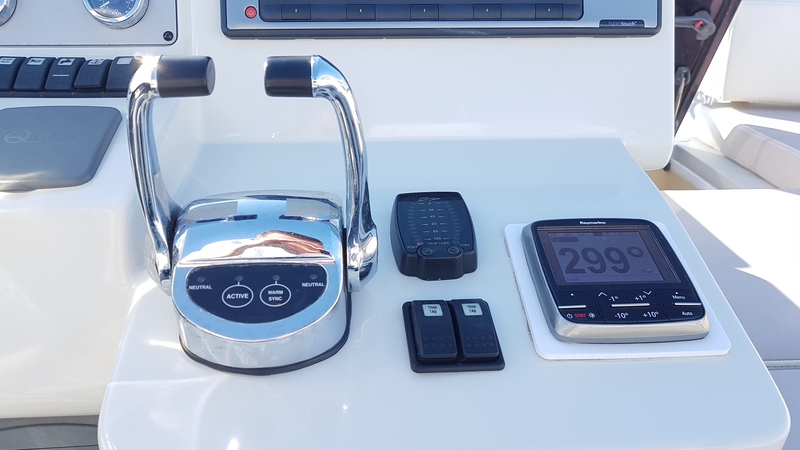 Electric Windlass with winch controls and chain locker on the forward deck. 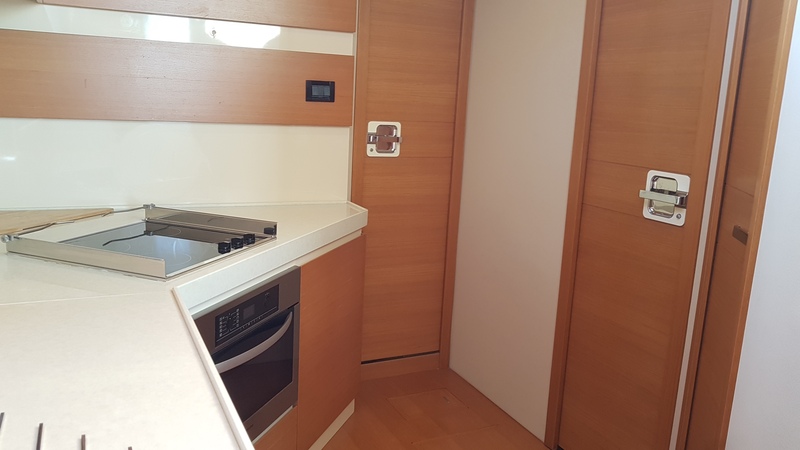 Refrigerator and freezer in galley, 165 l.
This beautiful Azimut 45 Fly is still from her first owner and is hardly used, but during the years constantly upgraded, no expensive spared. 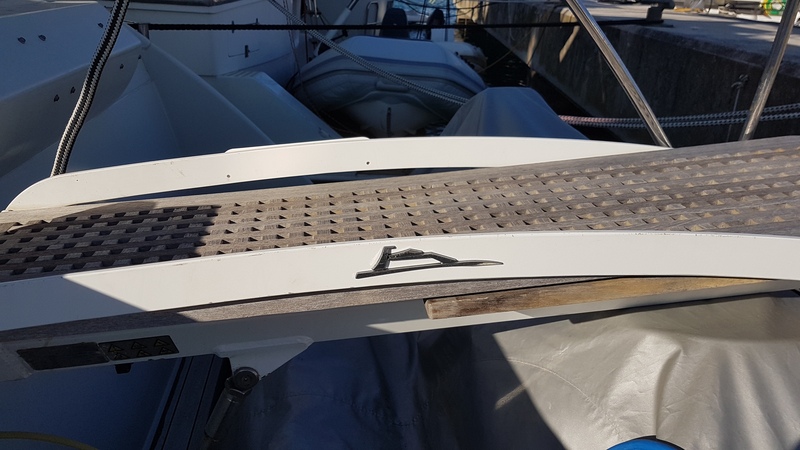 Mid april 2019 she was cleaned, antifouled and new anodes were fitted. She is ready for the season! 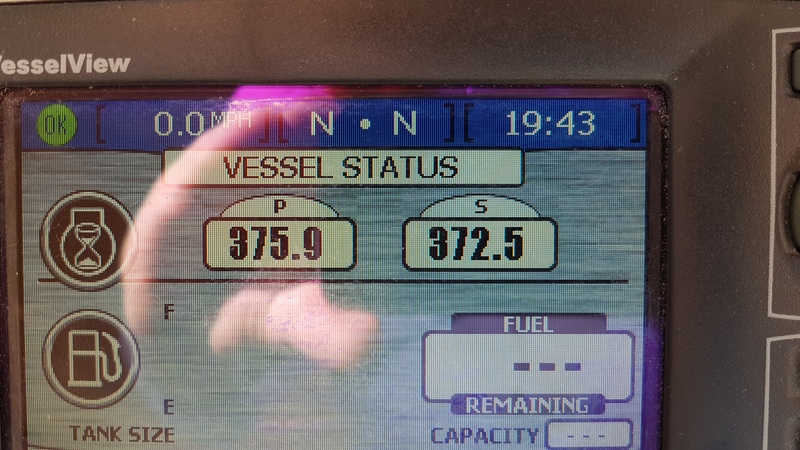 She is VAT paid, all documented and in an very good condition. 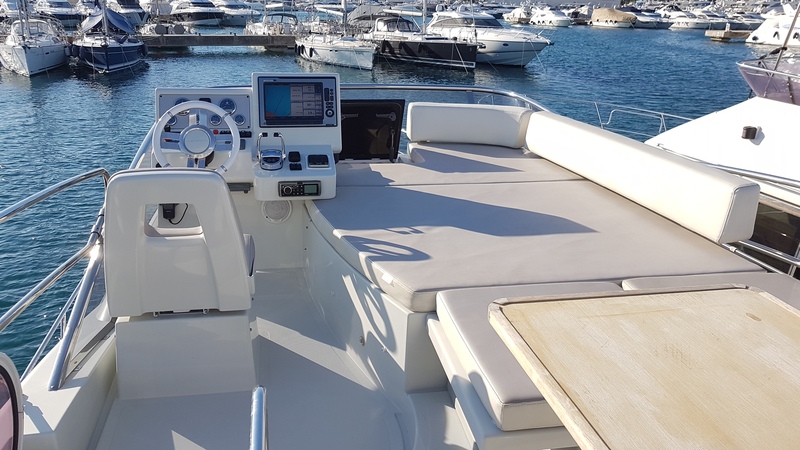 We would like to invite you to make an appointment and meet us at this beautiful yacht! 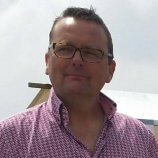 Call, What’sapp or mail us for more info or an appointment. 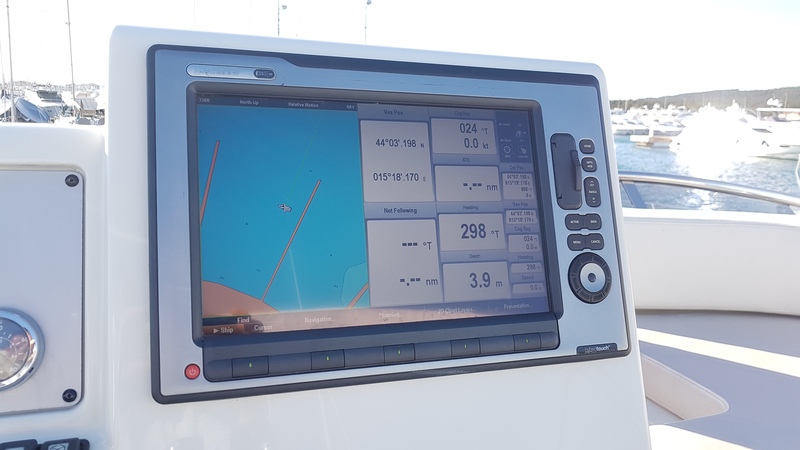 Boattest.com: full test of the Atlantis 51. 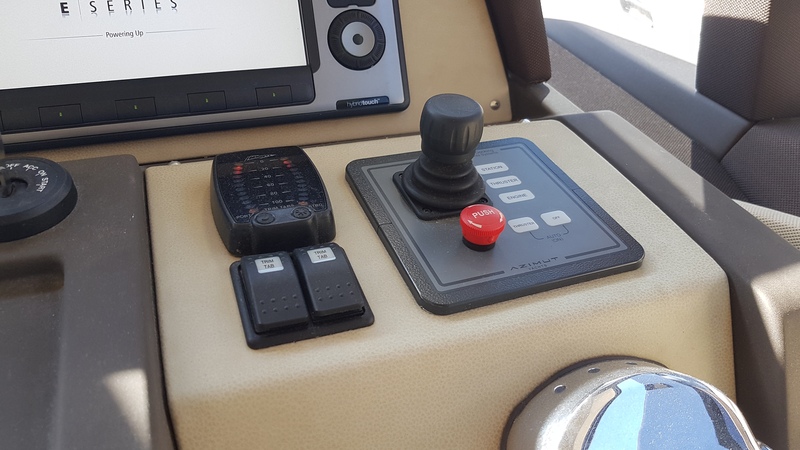 Azimut S6 getest voor blad Varen.